We recommend checking out our discussion threads on the Pioneer Elite SC-95 9.2-Channel Network A/V Receiver SC-95, which address similar problems with connecting and setting up Receivers Pioneer. The user manual for the Pioneer Elite SC-95 9.2-Channel Network A/V Receiver SC-95 provides necessary instructions for the proper use of the product TVs & Entertainment - Receivers & Amplifiers - Receivers. The efficient and powerful Elite SC-95 9.2-Channel Network A/V Receiver from Pioneer is well equipped to handle high-resolution audio and video sources. This model can produce up to 135W per channel in stereo mode at 8 ohms and supports dual subwoofer connections for enhanced low frequency sound. The SC-95 incorporates Pioneer's digital class D³ power amplifier technology and is designed to deliver dynamic sound from high-resolution audio formats like Dolby TrueHD and DTS-HD. Integrated Advanced MCACC Pro room calibration allows you to tailor the sound of the receiver to your listening environment using the calibration microphone. It even incorporates high-quality ESS Technology 32-bit digital-to-analog converters for optimized sound quality. On-board Dolby Atmos and DTS:X support allows you to add optional height-channel speakers, which is designed to deliver immersive, object-oriented sound. Built-in dual-band Wi-Fi and Ethernet connectivity allows you to access Internet radio sources like vTuner and Pandora. Bluetooth and Apple AirPlay are on-board, which allows you to wirelessly stream music from compatible audio sources such as smartphones and tablets. DLNA support is also available for streaming content from your other network-enabled, DLNA-compatible devices. The Pioneer SC-95 is equipped with eight HDMI inputs and three HDMI outputs for interfacing high-resolution audio and video components like Blu-ray players and streaming devices. In addition to 1080p, 3D, and 4K pass-through, this model can upscale lower resolution video to near-4K quality when used with a compatible display. This model also has a front-panel USB port that supports high-resolution audio formats like FLAC and WAV. For enhanced system control, the free iControlAV5 app is available for download on iOS and Android devices. This app will allow you to control the receiver from your compatible smartphone and tablet. If you own a Pioneer receivers and have a user manual in electronic form, you can upload it to this website using the link on the right side of the screen. Box Dimensions (LxWxH) 20.5 x 20.5 x 11.25"
The user manual for the Pioneer Elite SC-95 9.2-Channel Network A/V Receiver SC-95 can be downloaded in .pdf format if it did not come with your new receivers, although the seller is required to supply one. It is also quite common that customers throw out the user manual with the box, or put the CD away somewhere and then can’t find it. That’s why we and other Pioneer users keep a unique electronic library for Pioneer receiverss, where you can use our link to download the user manual for the Pioneer Elite SC-95 9.2-Channel Network A/V Receiver SC-95. 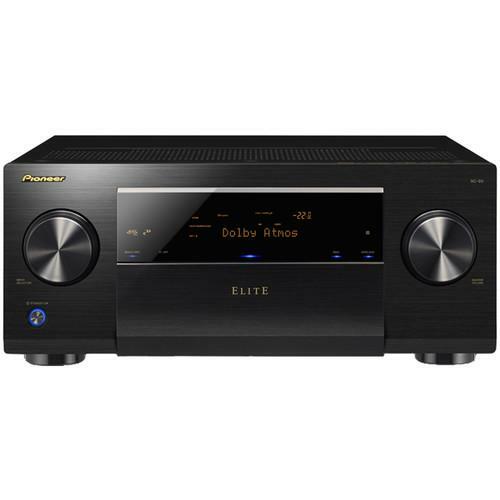 The user manual lists all of the functions of the Pioneer Elite SC-95 9.2-Channel Network A/V Receiver SC-95, all the basic and advanced features and tells you how to use the receivers. The manual also provides troubleshooting for common problems. Even greater detail is provided by the service manual, which is not typically shipped with the product, but which can often be downloaded from Pioneer service. If you want to help expand our database, you can upload a link to this website to download a user manual or service manual, ideally in .pdf format. These pages are created by you – users of the Pioneer Elite SC-95 9.2-Channel Network A/V Receiver SC-95. User manuals are also available on the Pioneer website under TVs & Entertainment - Receivers & Amplifiers - Receivers. What kind of wireless headsets are appropriate for this amp? Will Bluetooth headsets receive from this unit or do I need a Bluetooth transmitter?